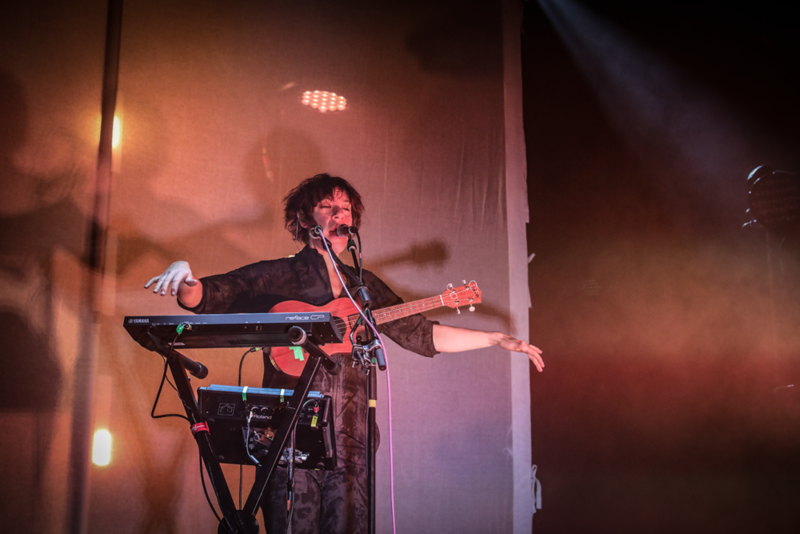 Her arms twisted above her like tree branches in the darkness, fingers fluttering like leaves as she initiated the first vocal sounds of the night and sent them sailing with her looping pedal. 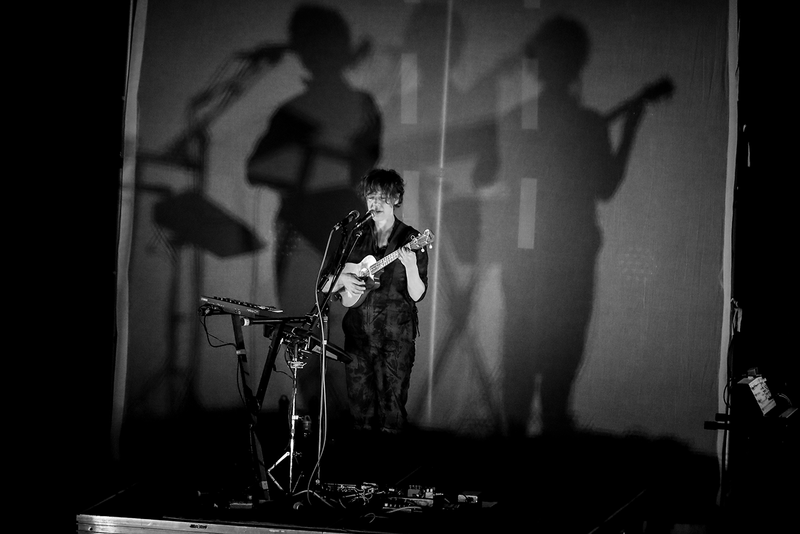 And right in time with the opening impacts of “Home,” a series of bright white lights illuminated her motions like big shadow puppet monsters behind the stage. 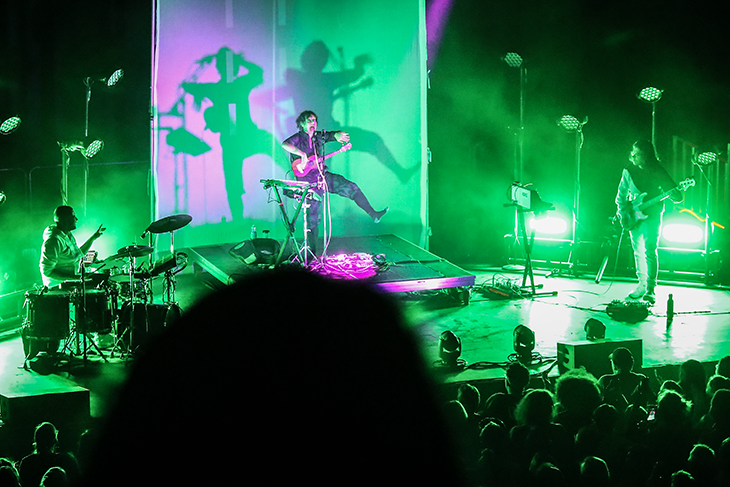 Seemingly all at once, the audience let out a burst of involuntary squeals, as if they’d just now realized where they were and what they were about to witness. 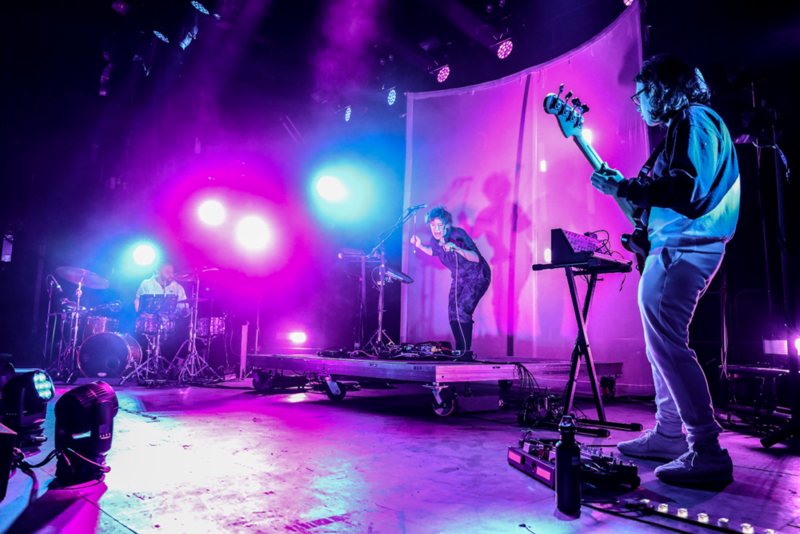 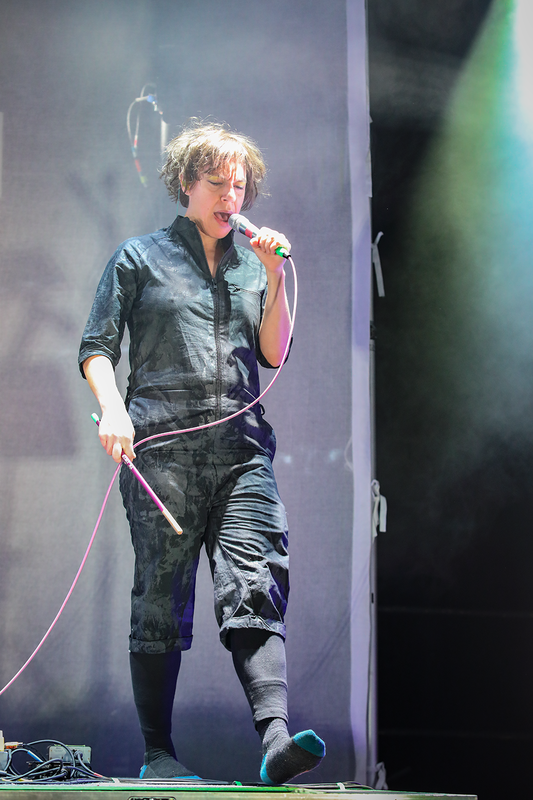 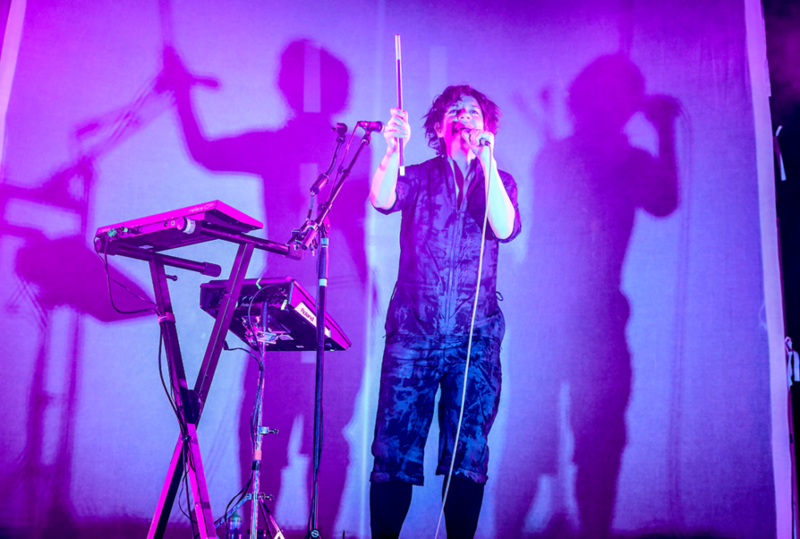 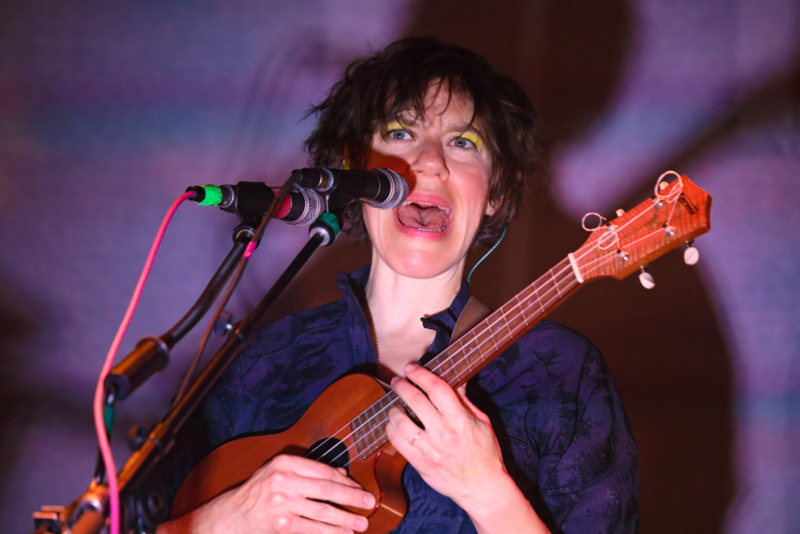 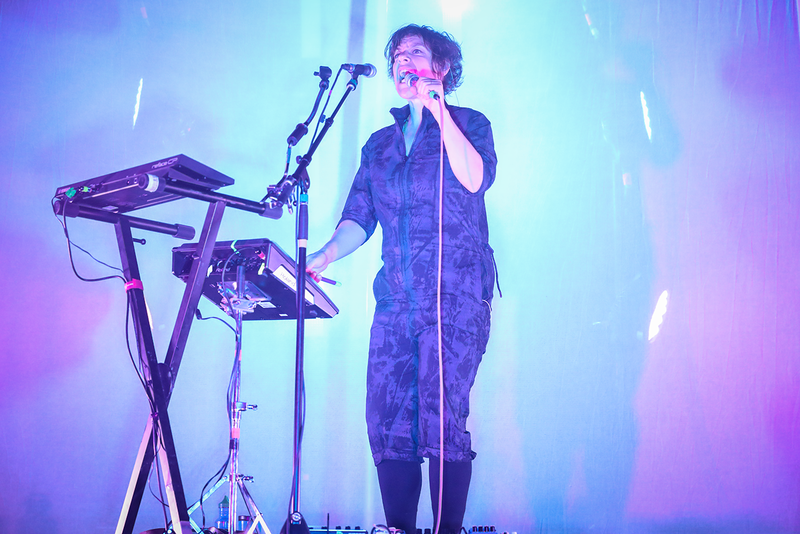 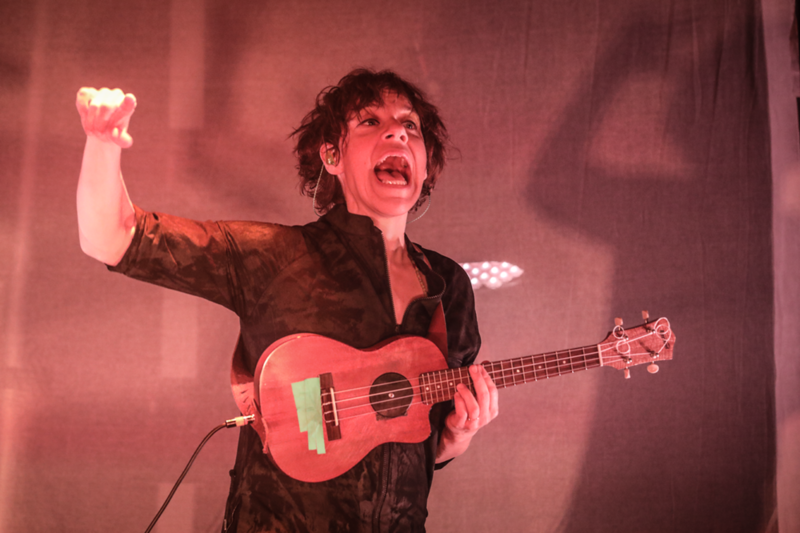 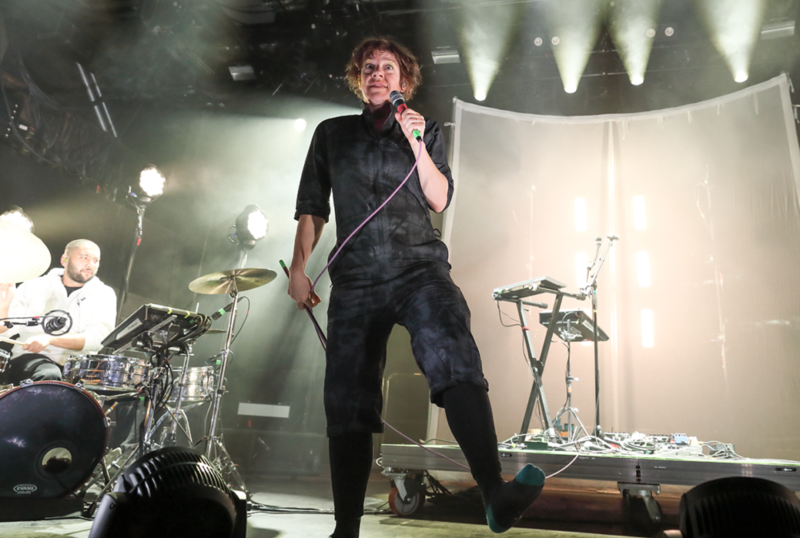 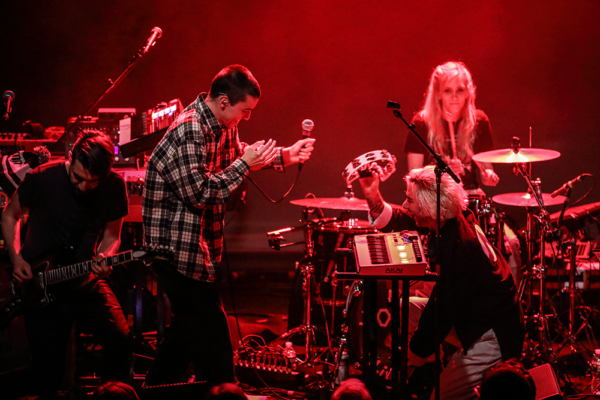 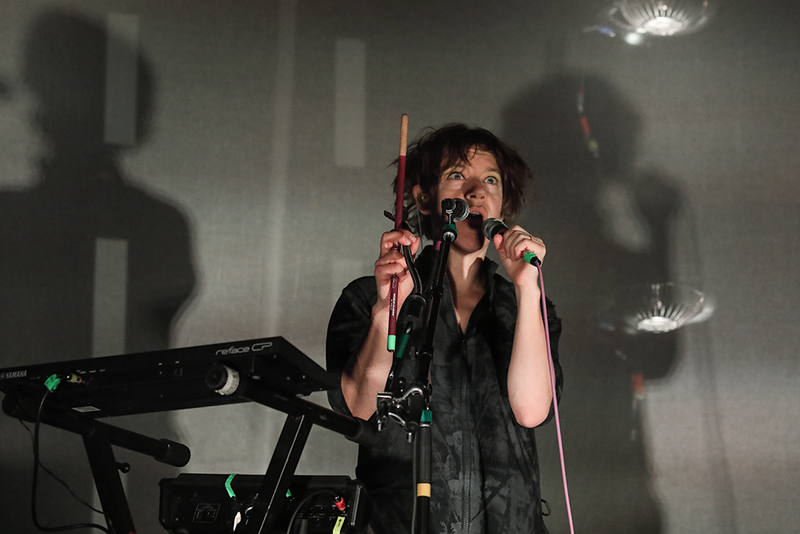 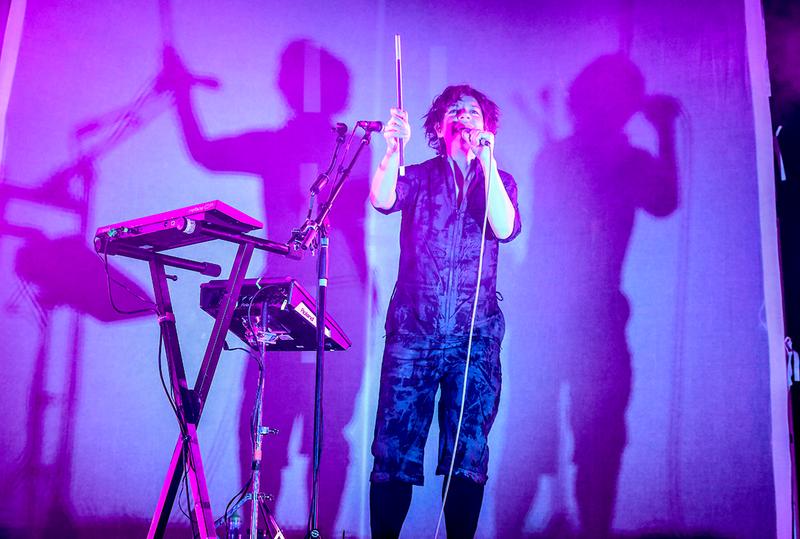 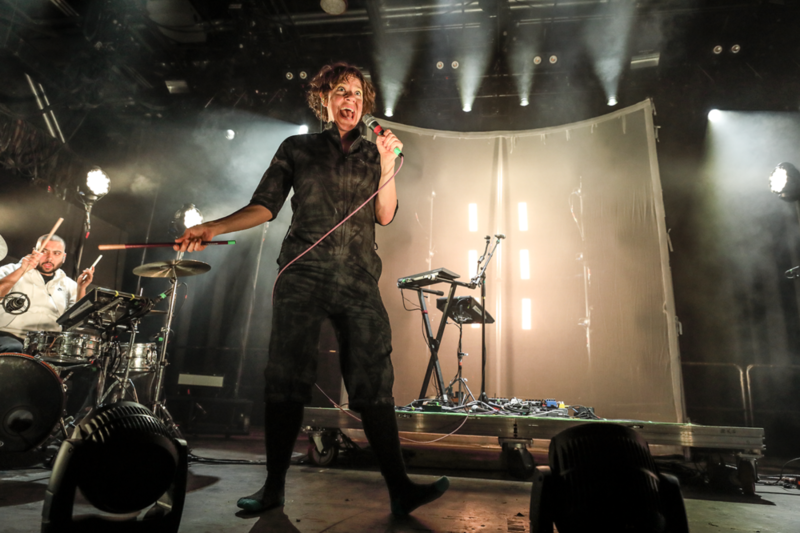 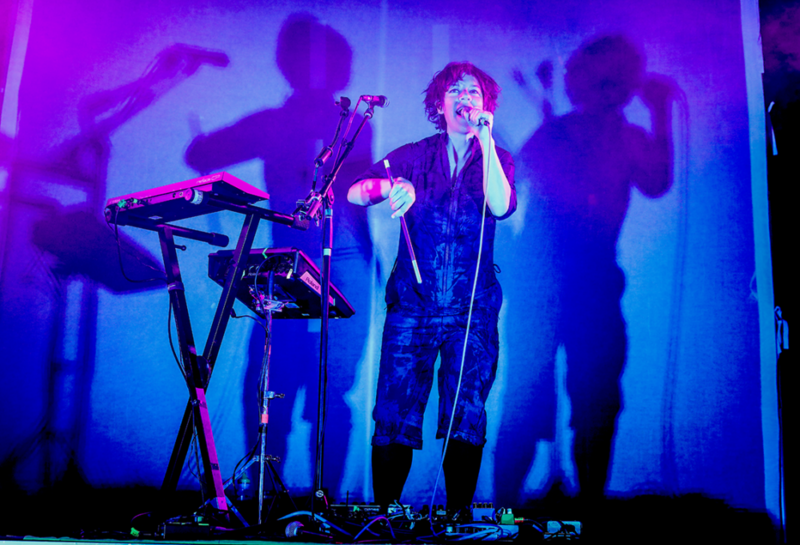 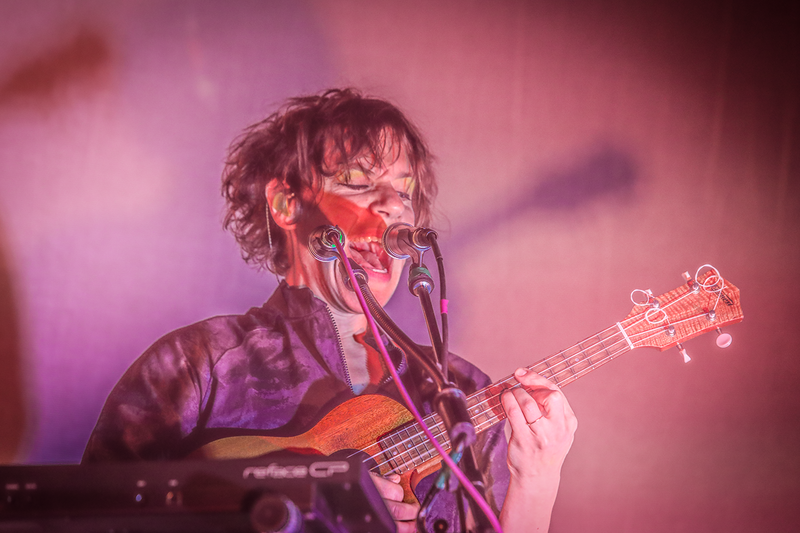 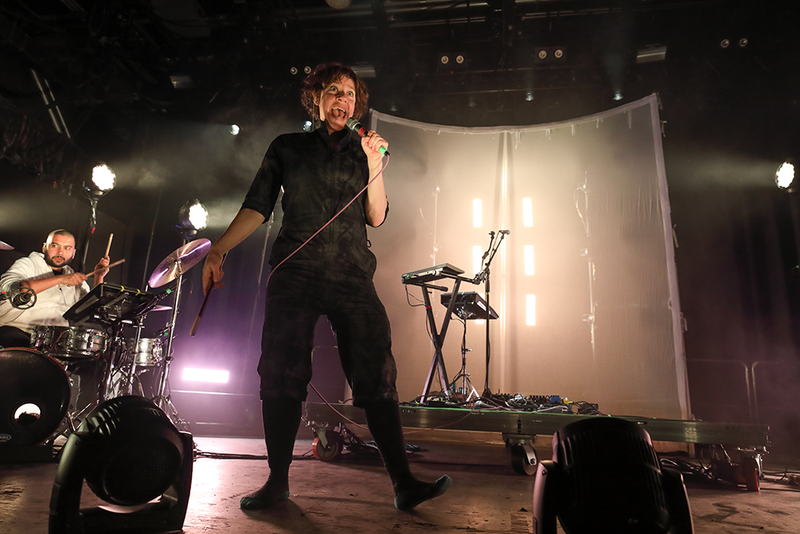 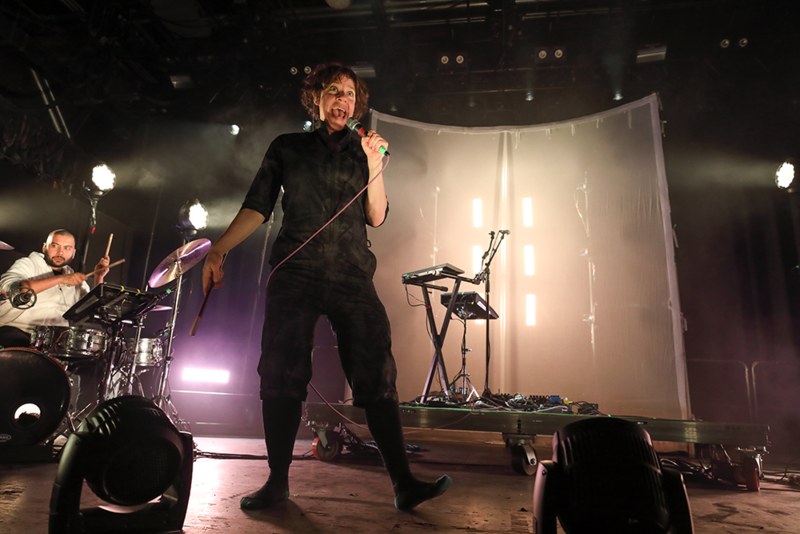 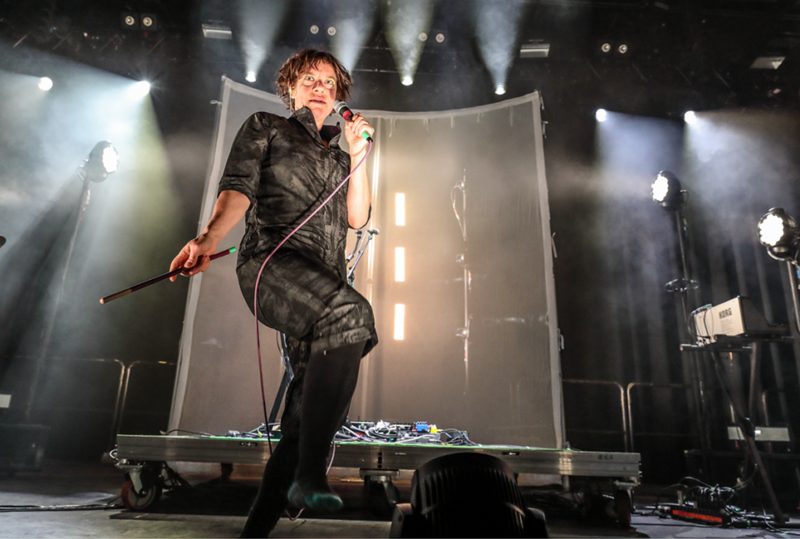 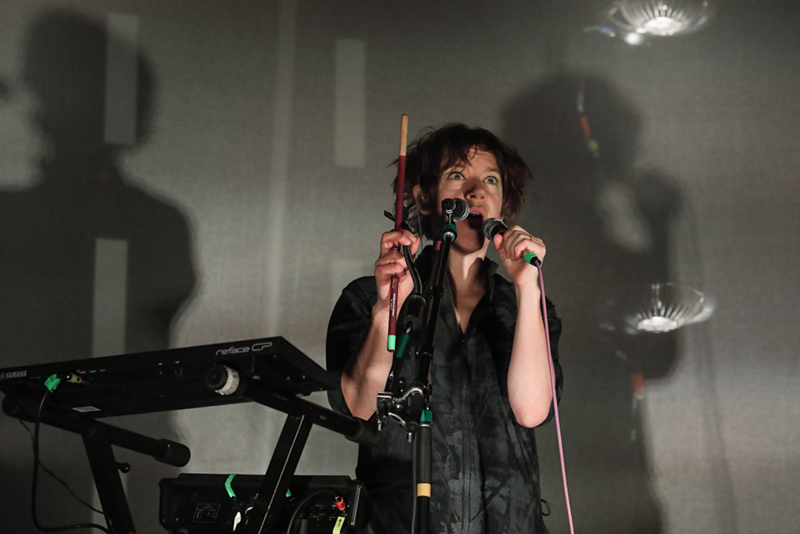 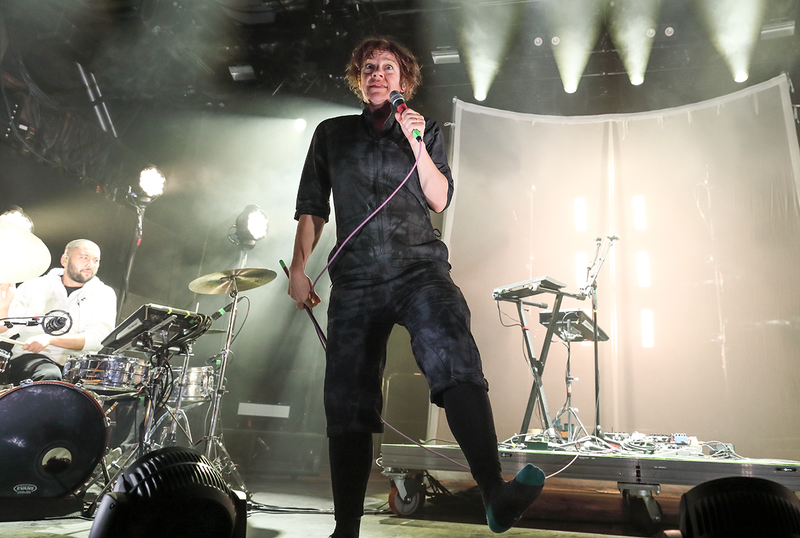 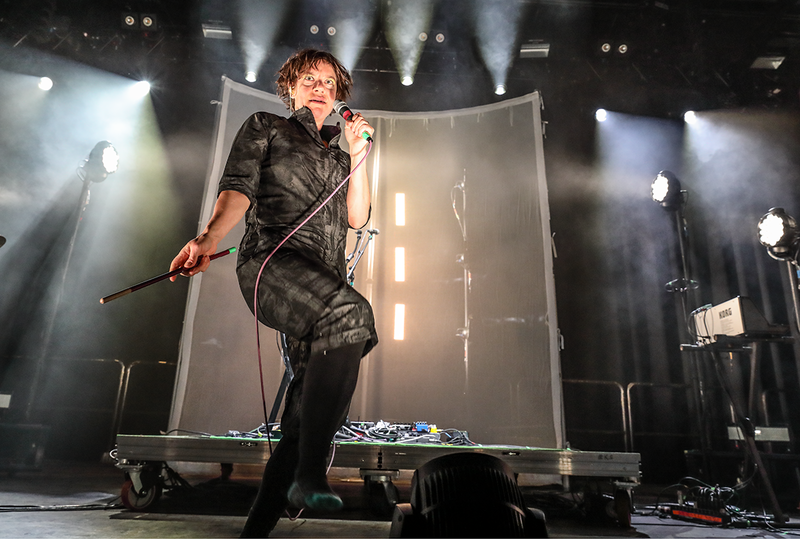 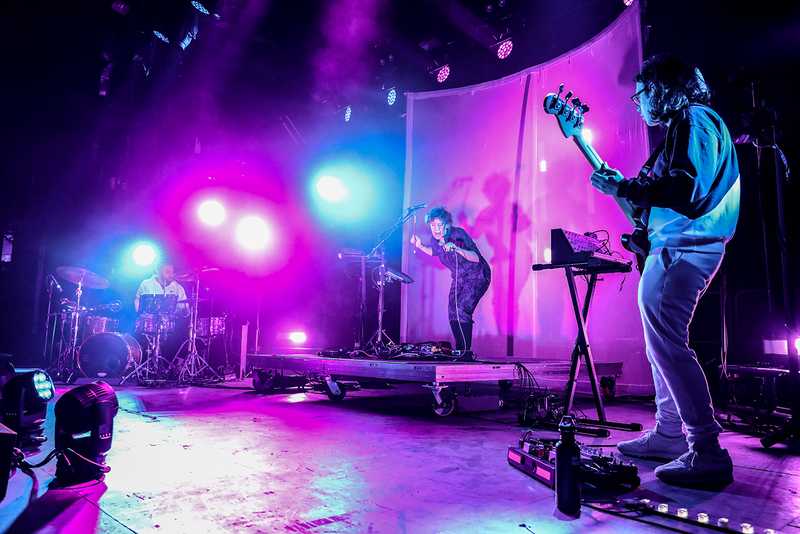 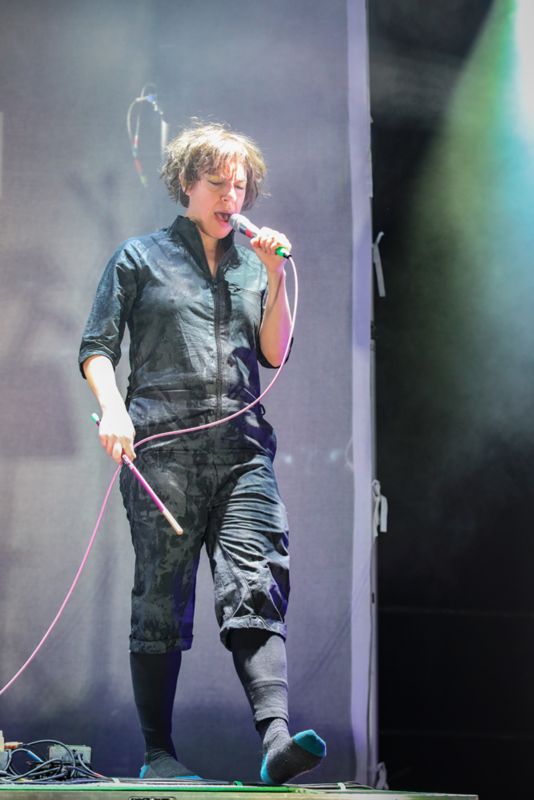 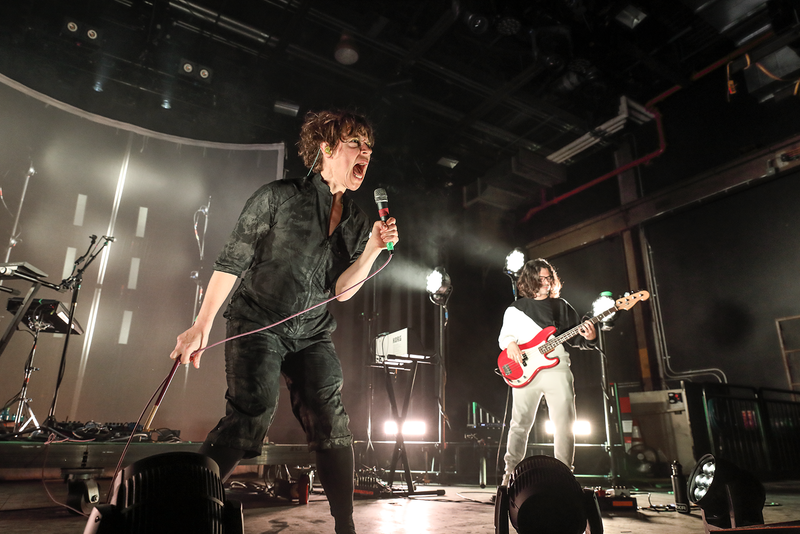 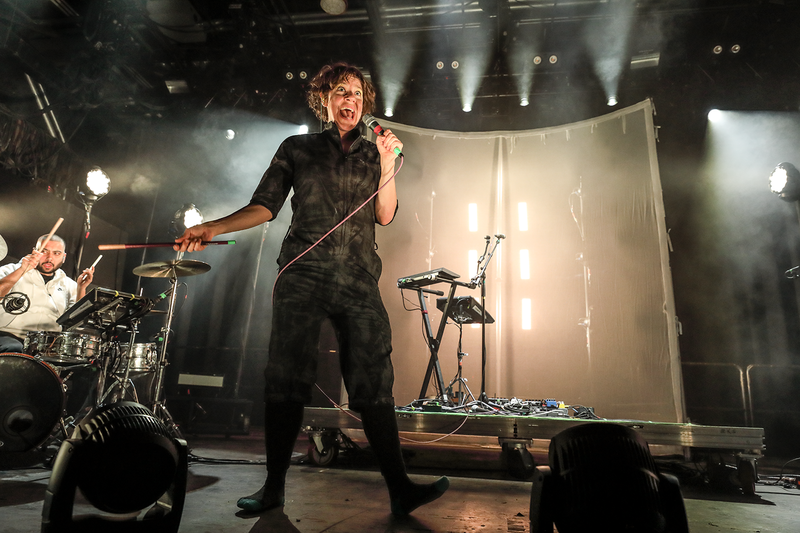 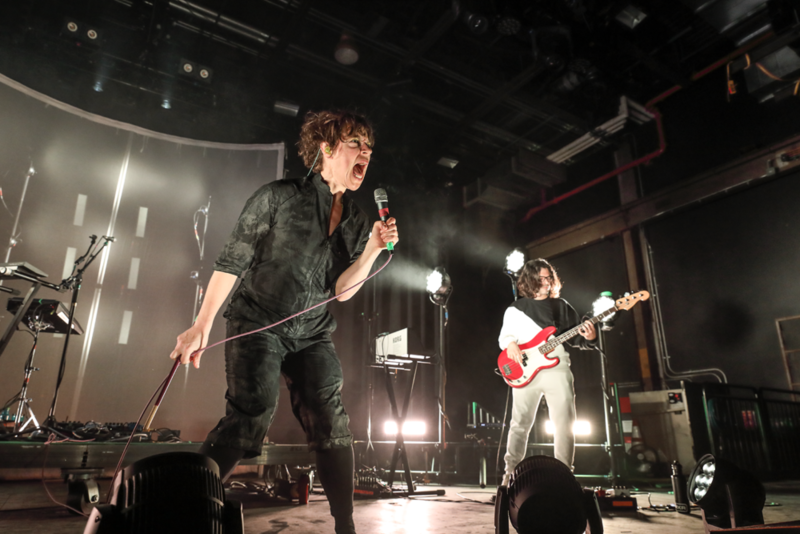 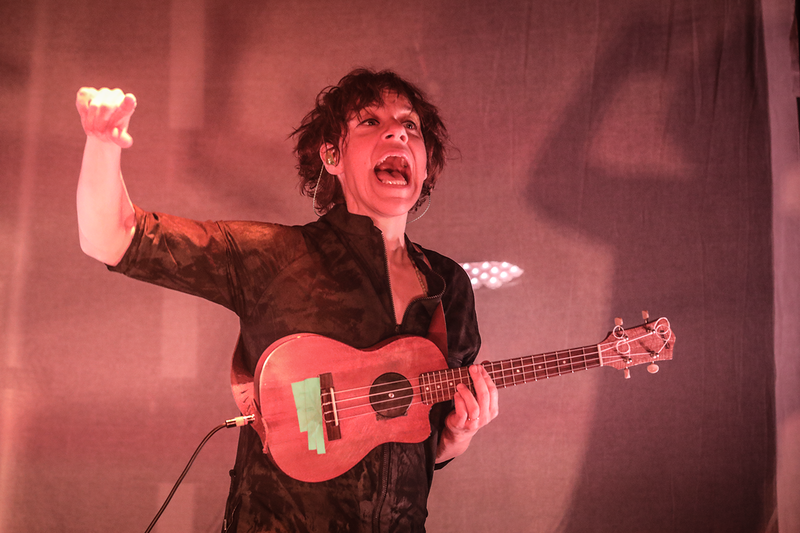 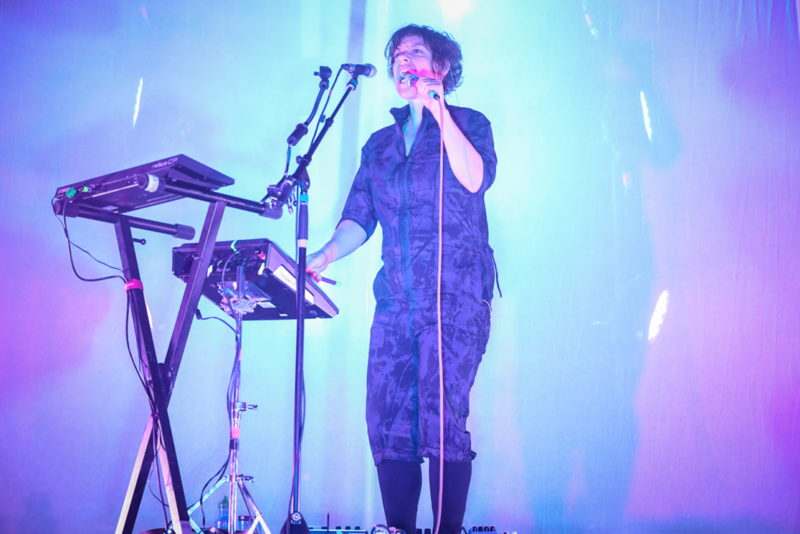 The NYC crowd was enveloped in the experimental bliss of Merrill Garbus at Brooklyn Steel on the last night of tUnE-yArDs’ U.S. tour leg, right before they took off for the U.K., and you could tell the band was hitting their groove before they’d reached the first verse. 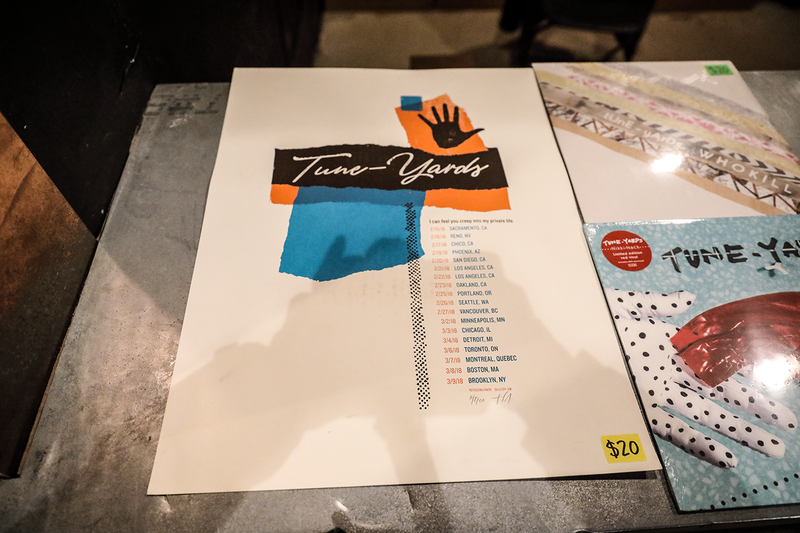 The hype was high for the Friday night show, and the sold-out venue was tightly packed with fans of all ages and demographics, many of whom were protecting armfuls of goodies from the merch table – including psychedelic tour shirts designed by artist Bud Snow, and all of the tUnE-yArDs vinyl, which (tested and approved) sounds fantastic. 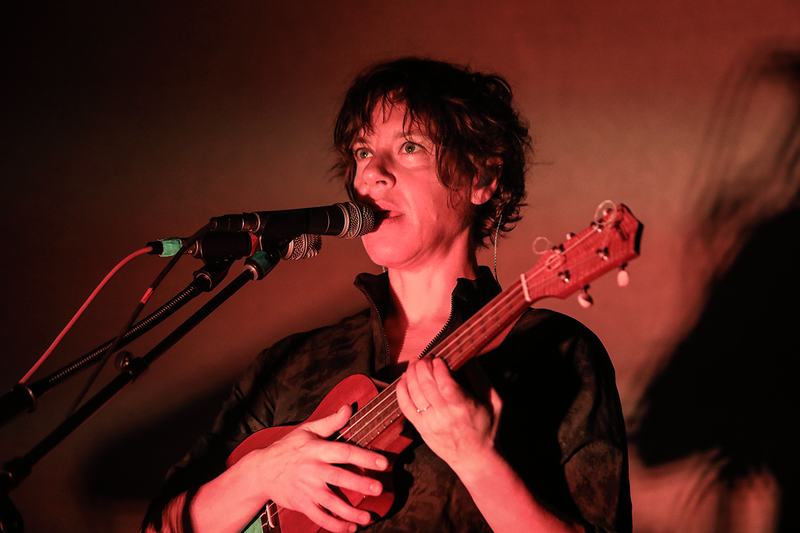 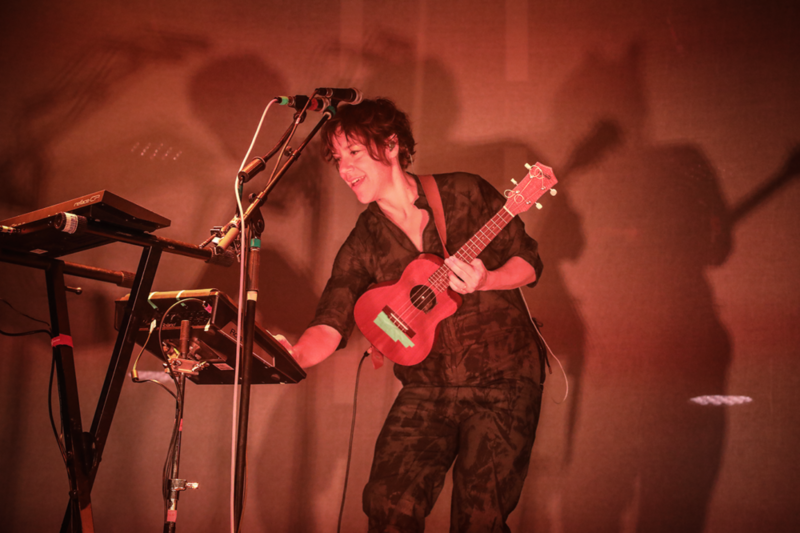 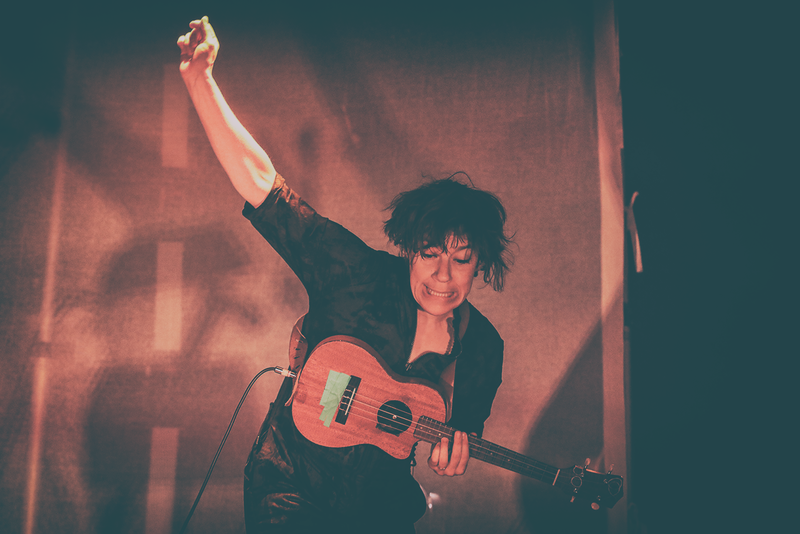 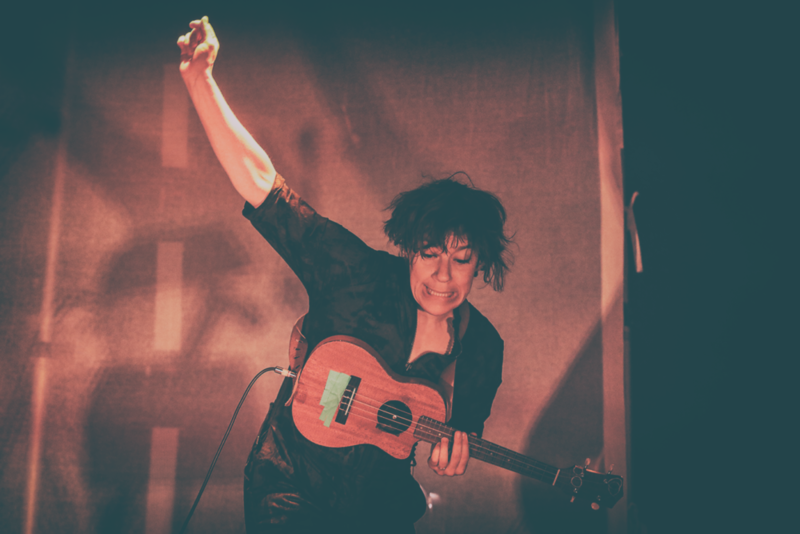 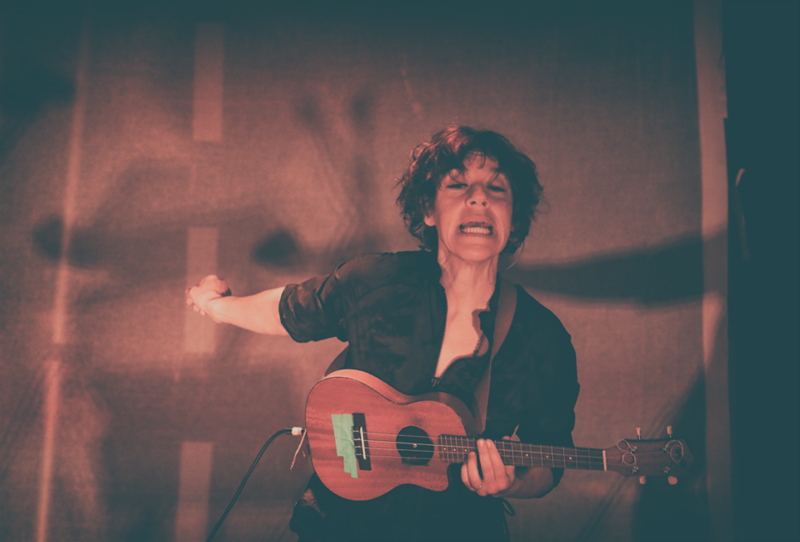 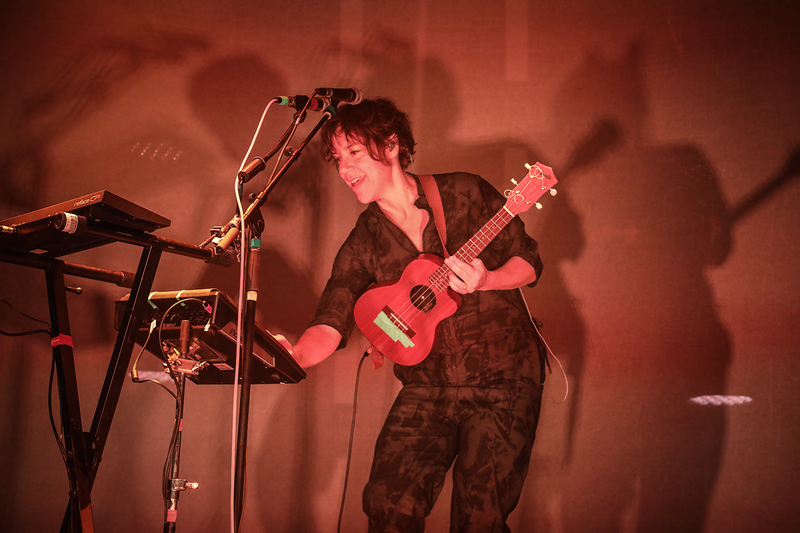 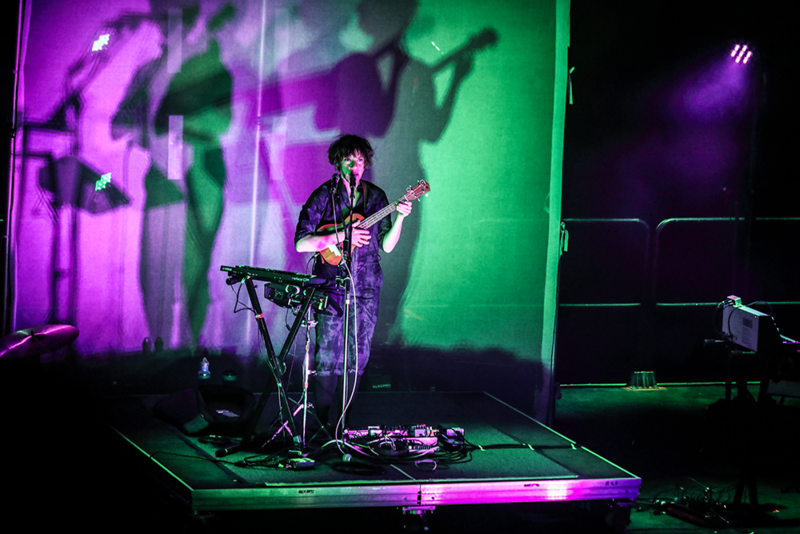 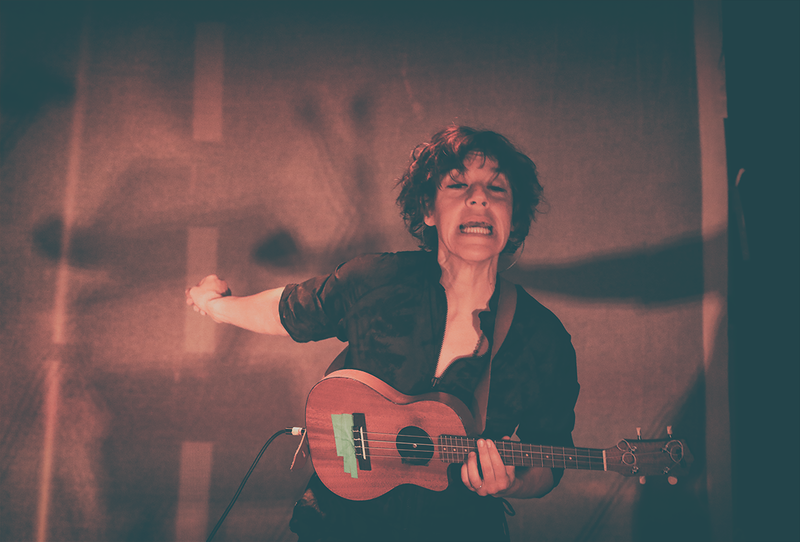 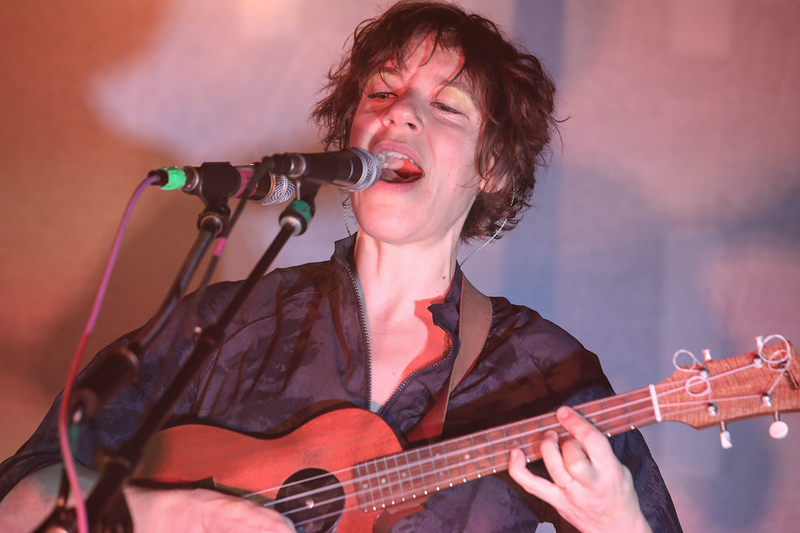 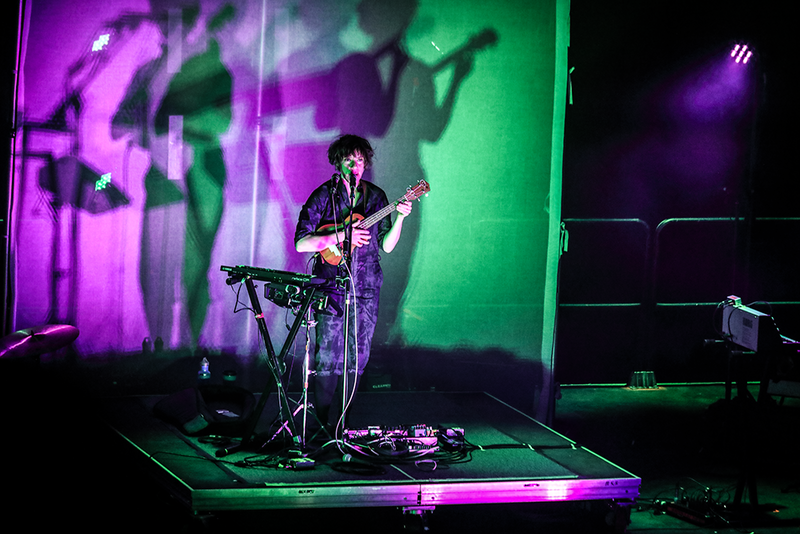 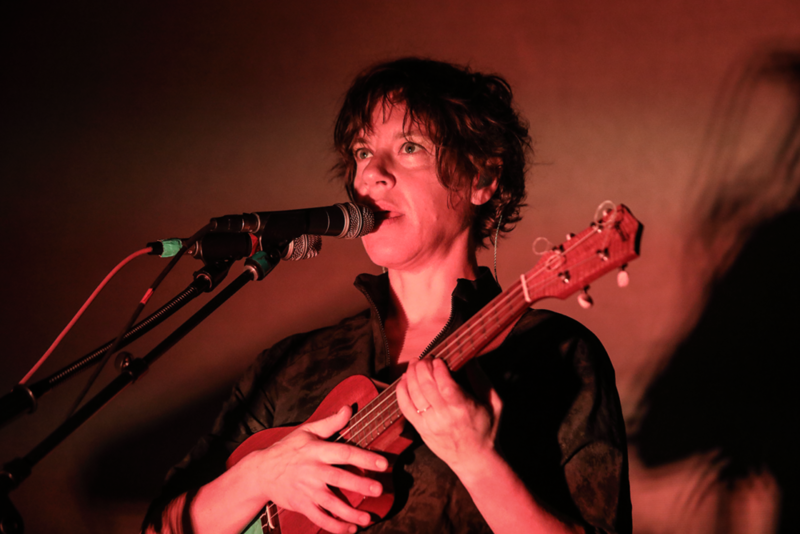 Whether or not they knew what to expect, the audience was visibly wowed as Garbus constructed fiercely cool melodies with her ukulele, effects pedals, and rich, emotive voice. 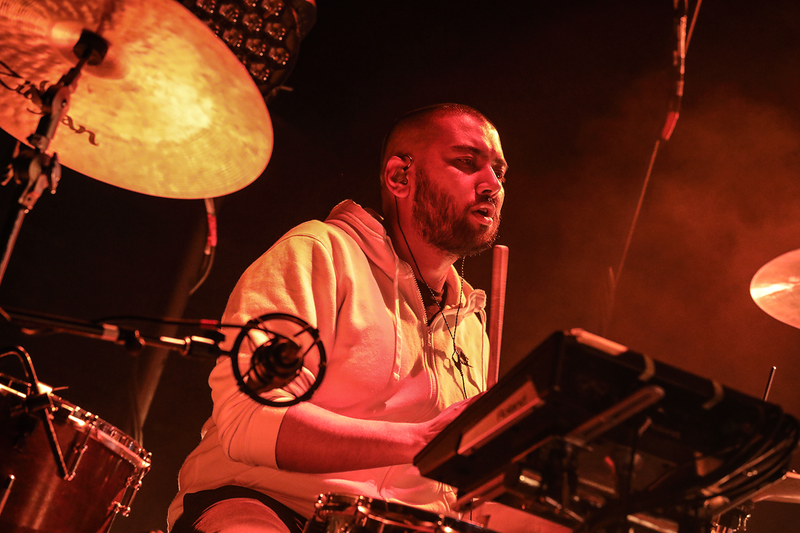 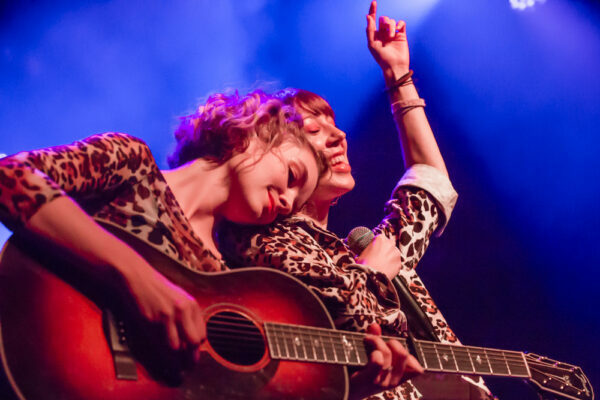 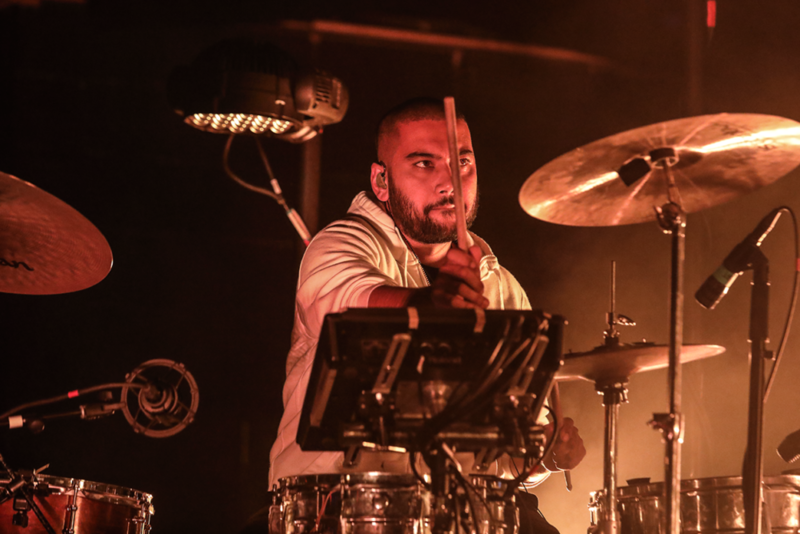 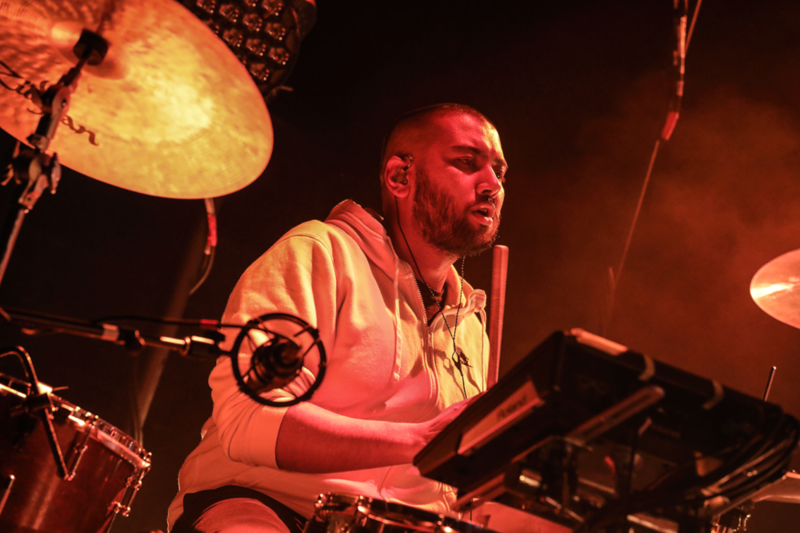 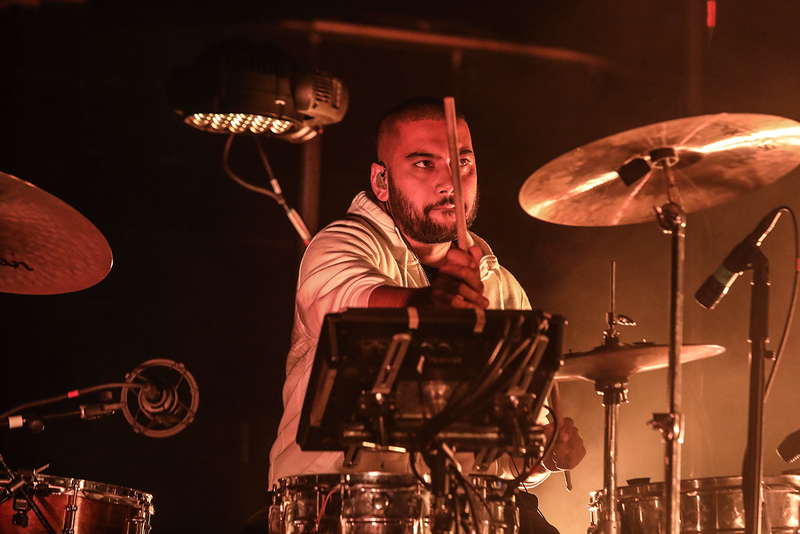 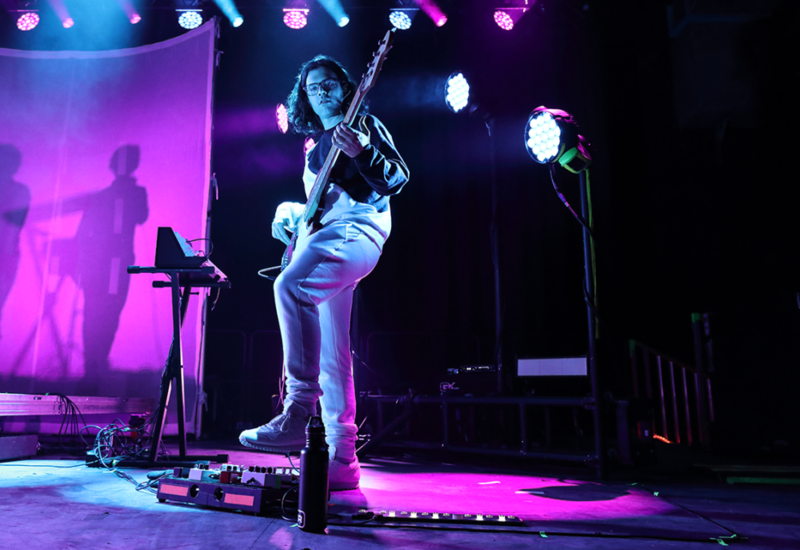 Sweetened by the sticky, syrupy basslines of her longtime counterpart, Nate Brenner, and the meticulous rhythms supplied by touring drummer Hamir Atwal, they pushed the momentum to new levels with a wild supply of eclectic grooves. 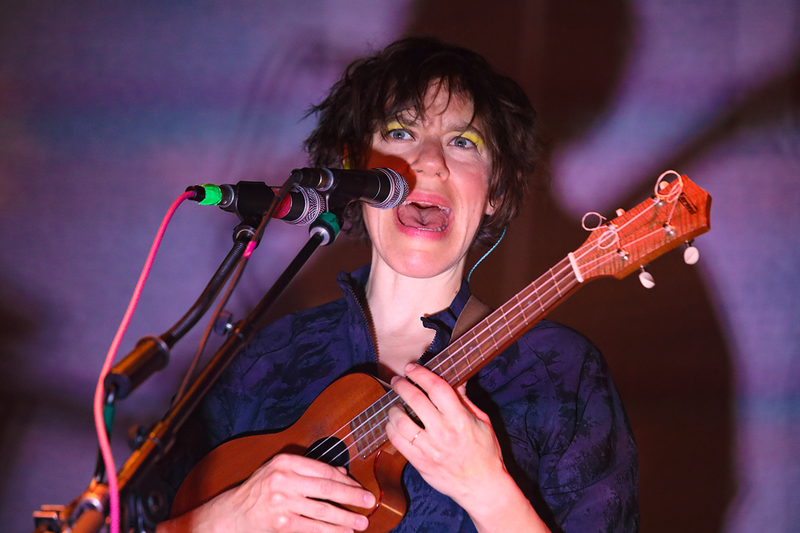 Treating Brooklyn to a truly satisfying setlist, in which fan favorites like “ABC 123,” “Water Fountain” (with a killer extended dance break), “Es-So,” and “Powa” not only came early, but in heart-racing succession, tUnE-yArDs were magnificently in sync, each beat and embellishment clicking into place like tumblers in a lock. 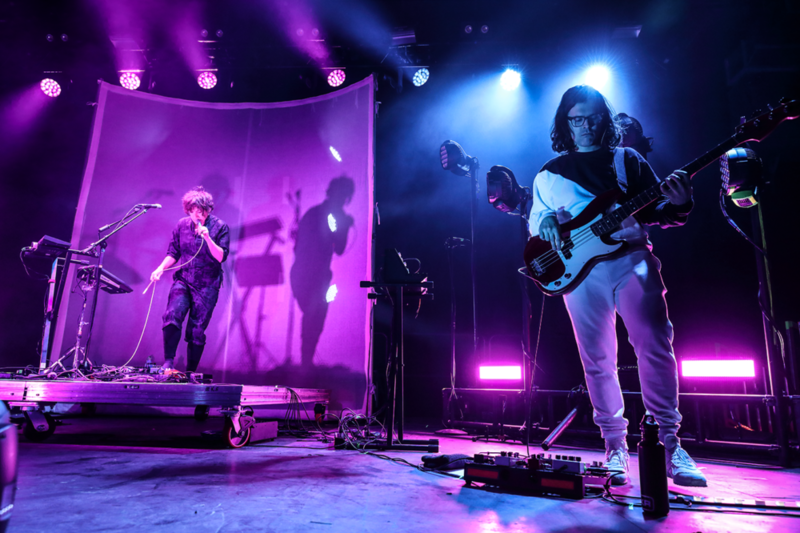 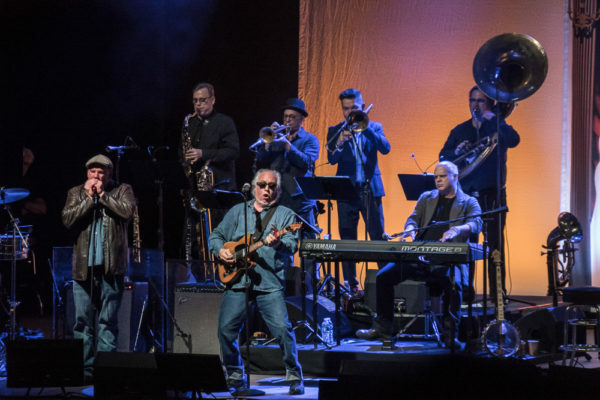 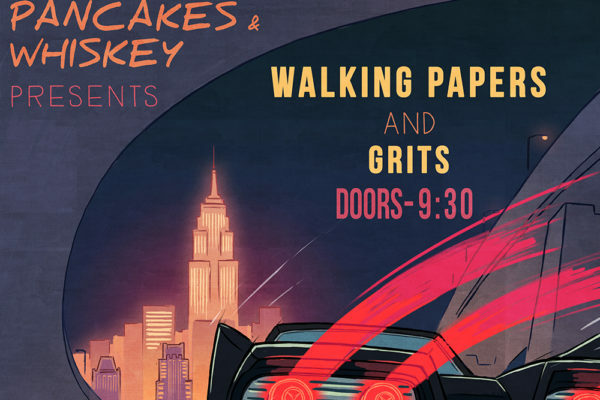 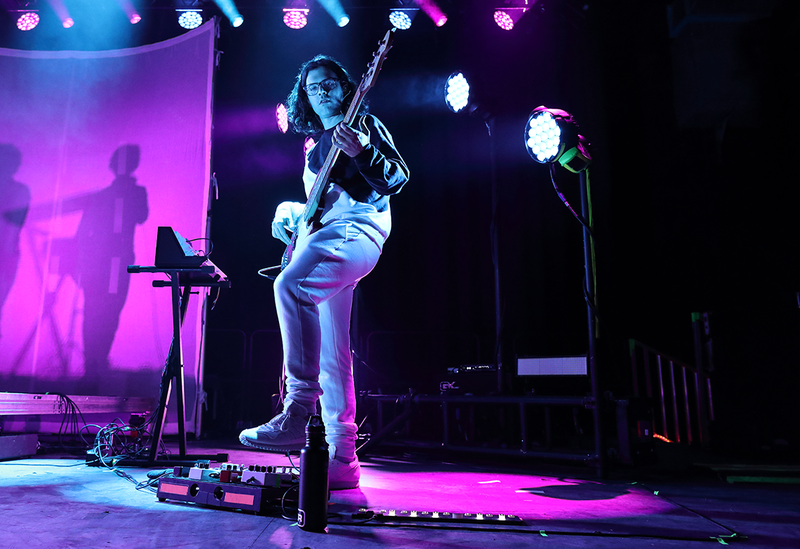 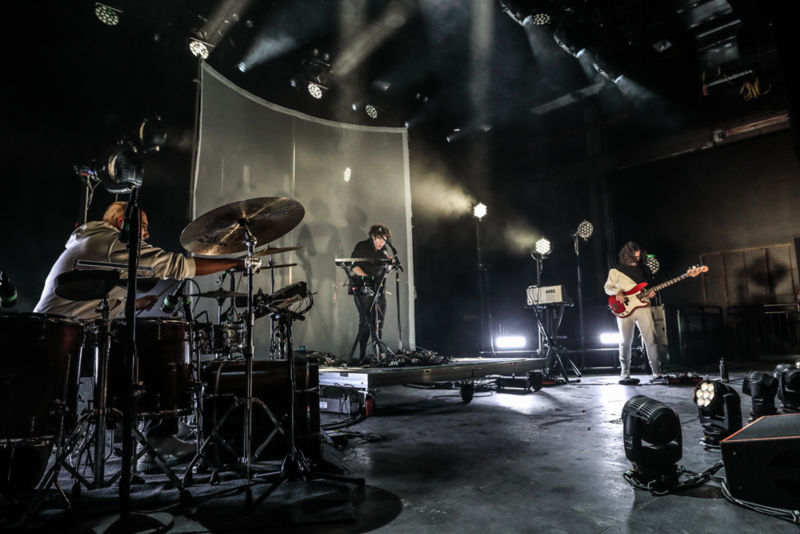 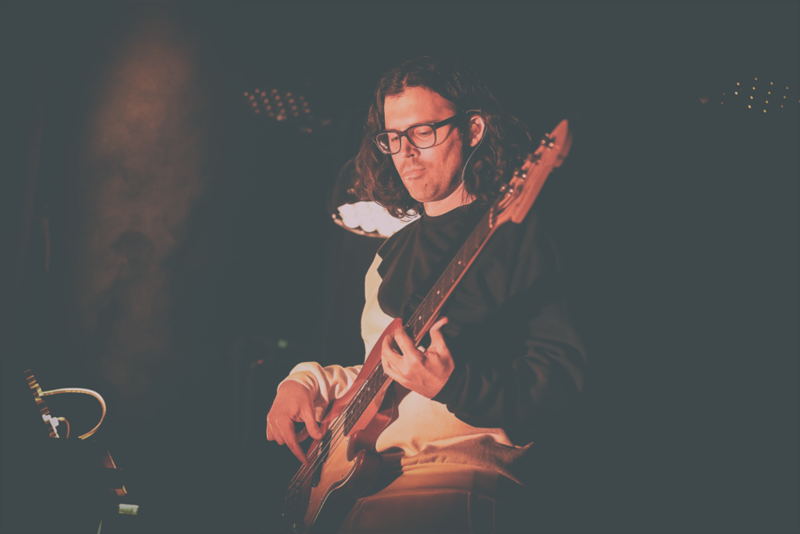 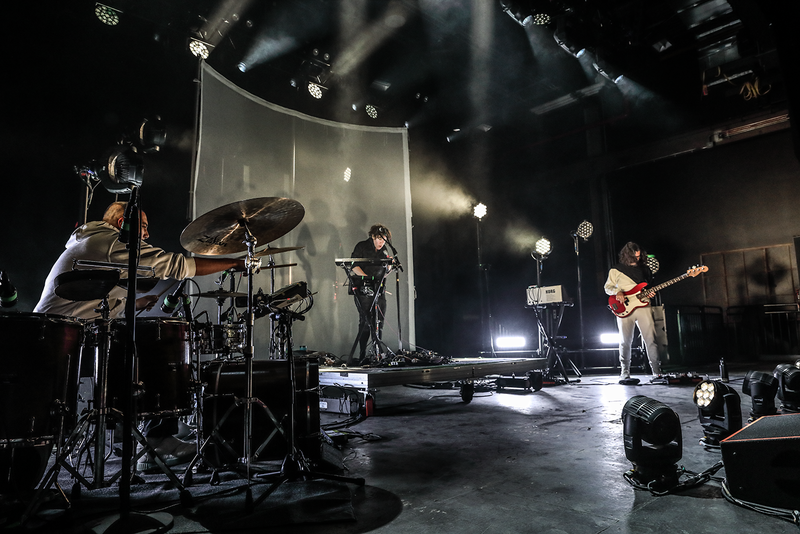 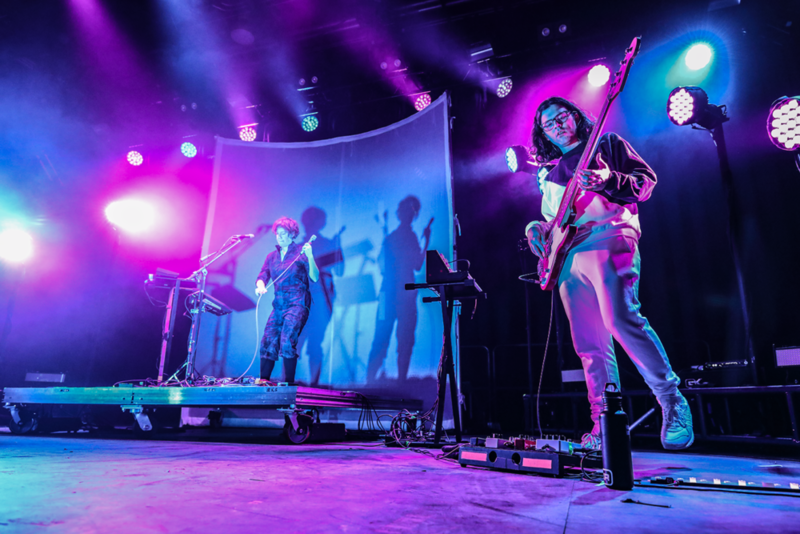 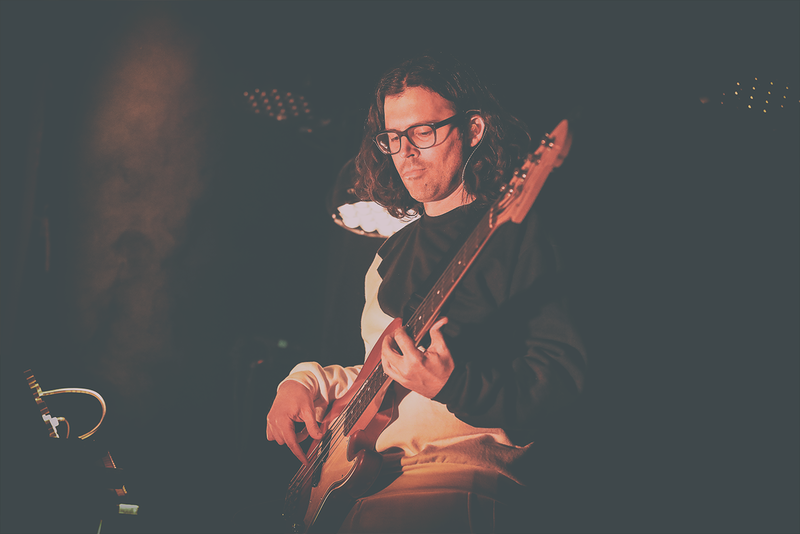 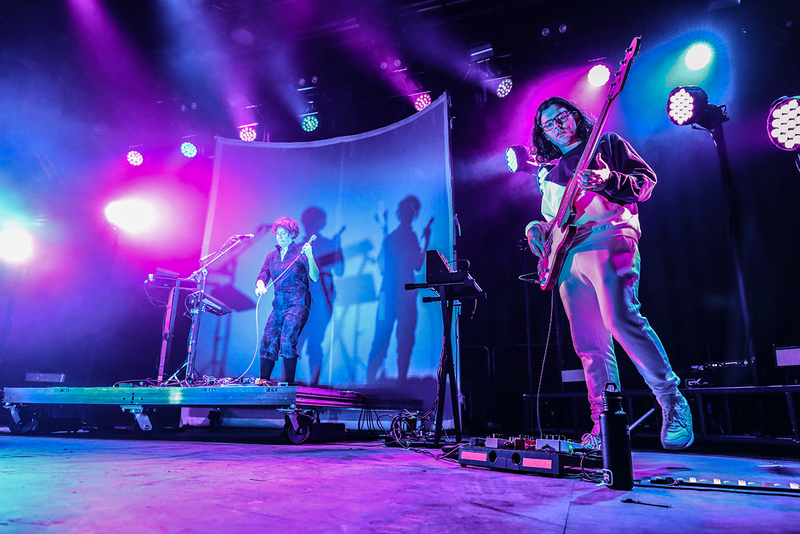 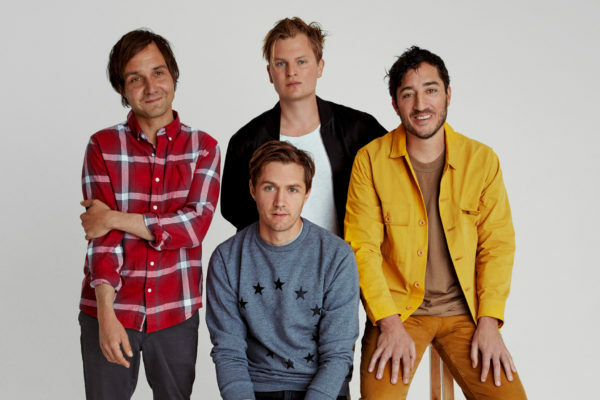 Compared to their previous, intimate Brooklyn show, when they were still working out songs from the record pre-release, it seemed that both the band and their fans had progressed nicely. 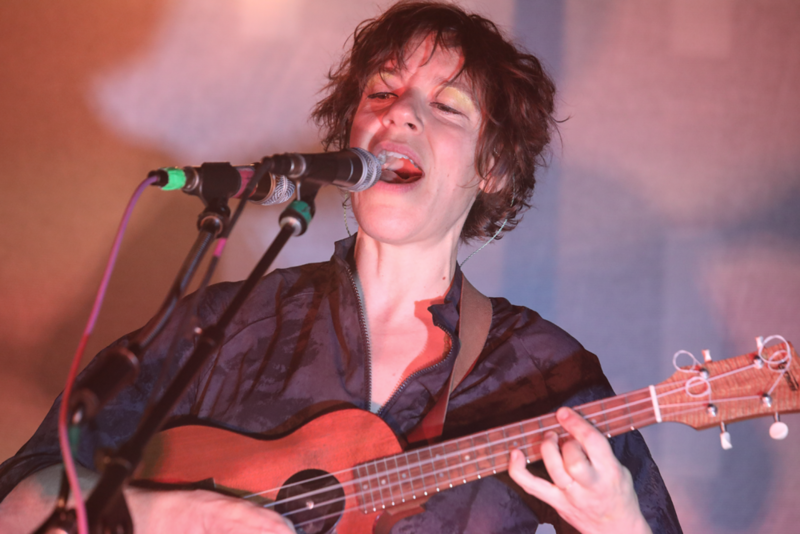 Many in the crowd were now well-versed in the lyrics and chants from the new album, I can feel you creep into my private life, and joined Garbus in singing her introspective words with passion. 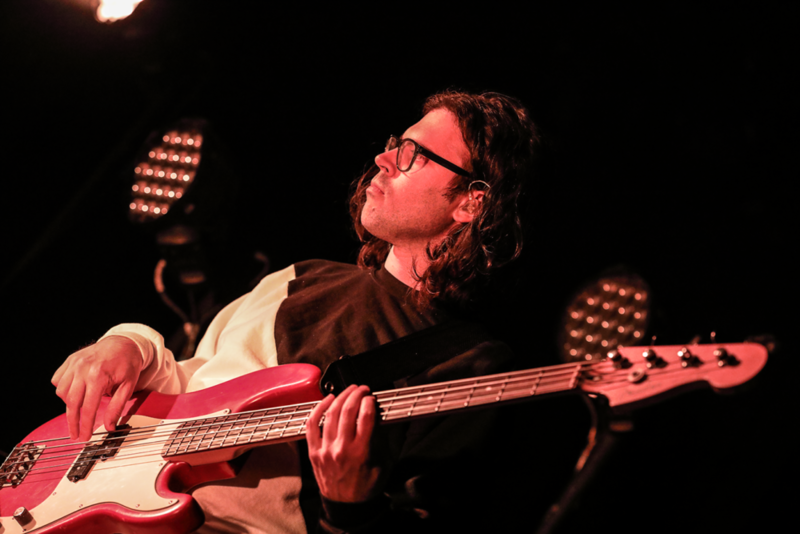 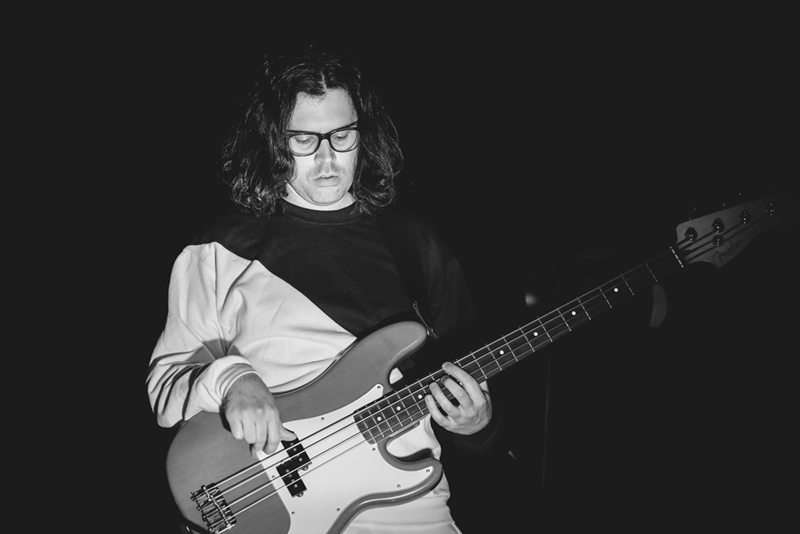 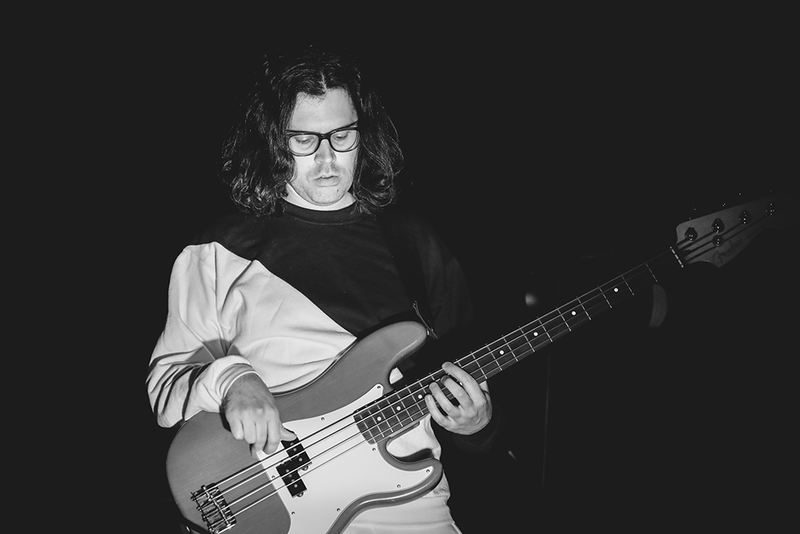 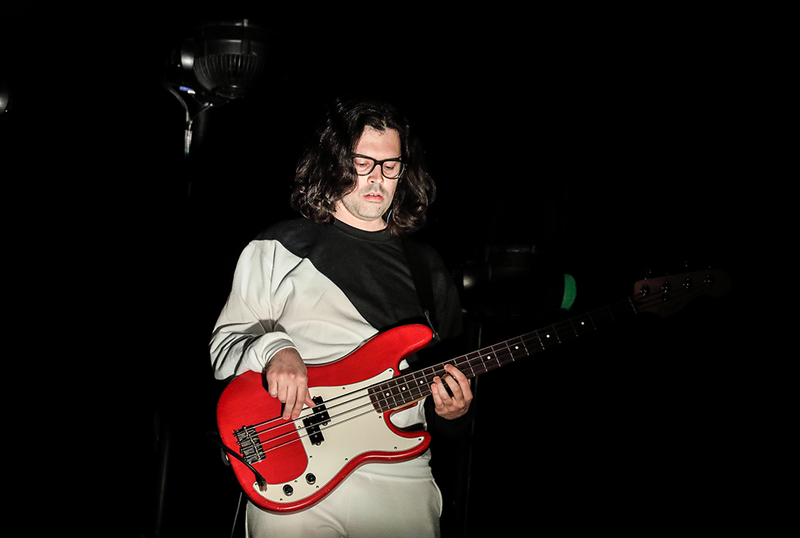 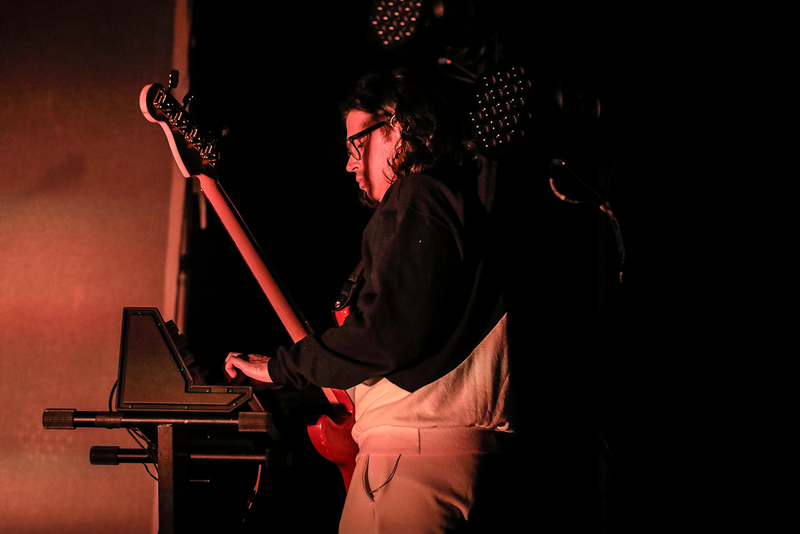 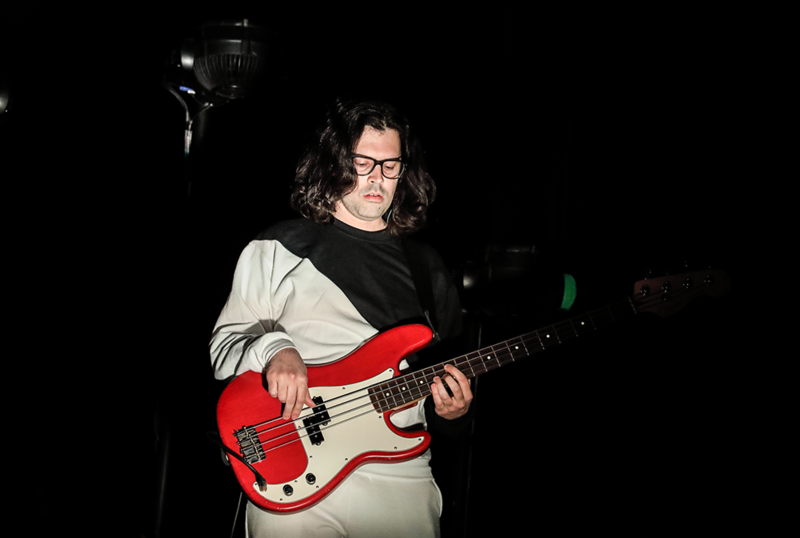 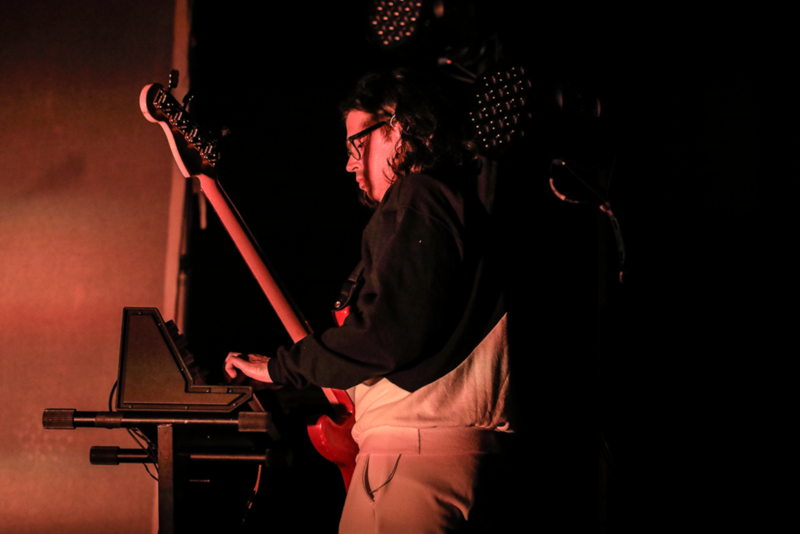 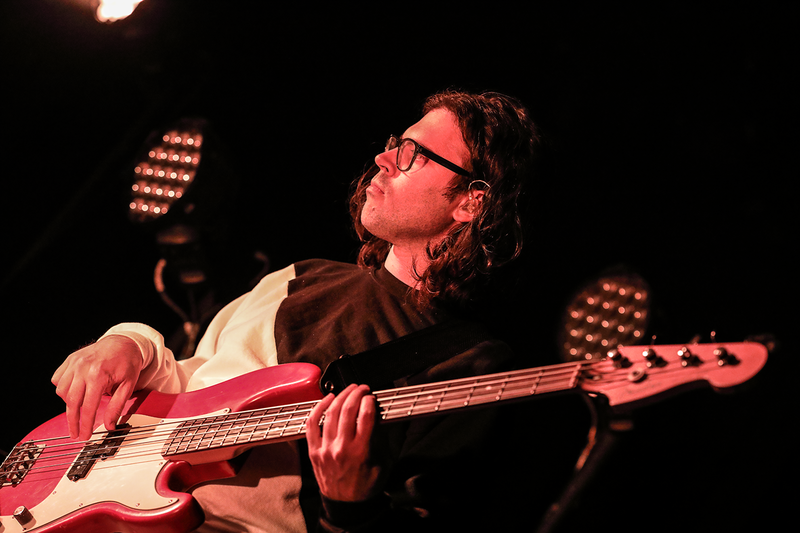 Typically quiet and solely focused on the musical concoction, which, on this night, was bubbling over with improvised transitions and surprises, Garbus broke form only briefly to instill a sincere thanks. 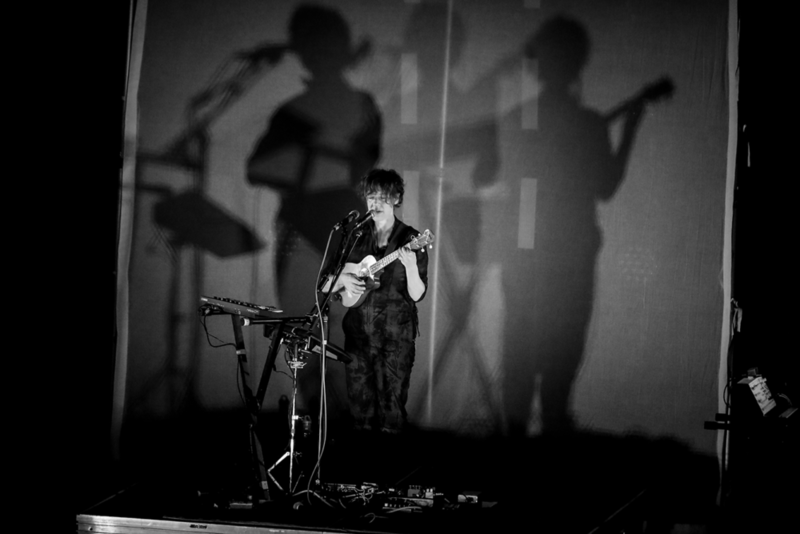 “I know, it’s a big deal to buy a ticket to a show,” she said with genuine empathy. 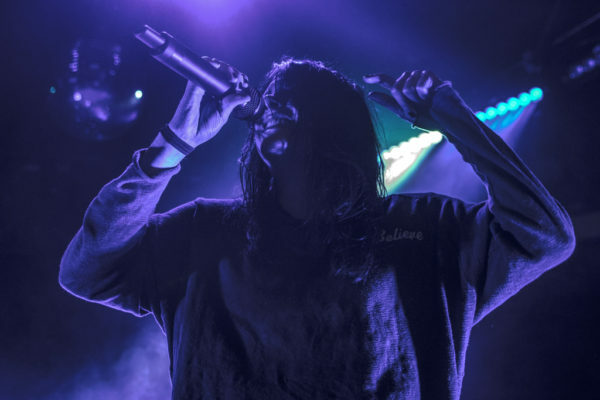 “It’s not the cheapest show on earth, and time is so precious… so thank you.” By the time she got to “thank you,” though, you could barely make out her voice over the loving cheers her words had prompted. 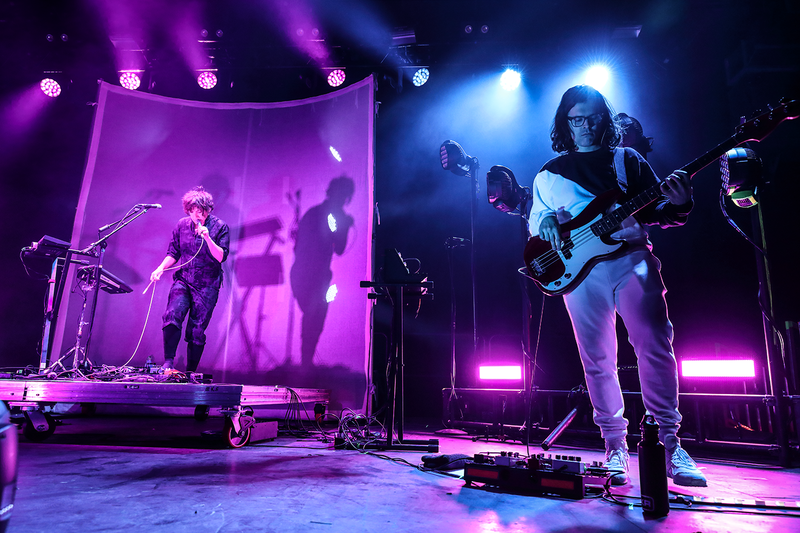 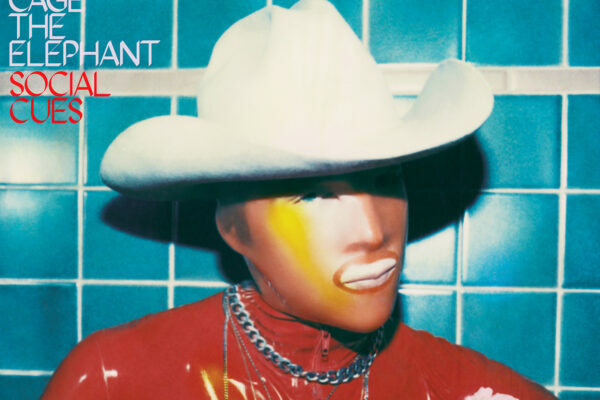 Leading up to an explosive finale of “Gangsta” and “Heart Attack,” with an encore of “Bizness” and “Free,” it was hard to imagine being strapped into a better ride. 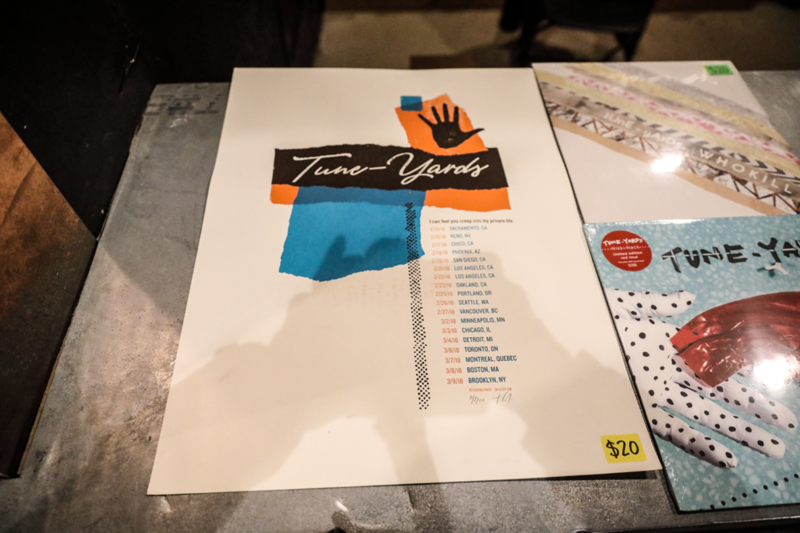 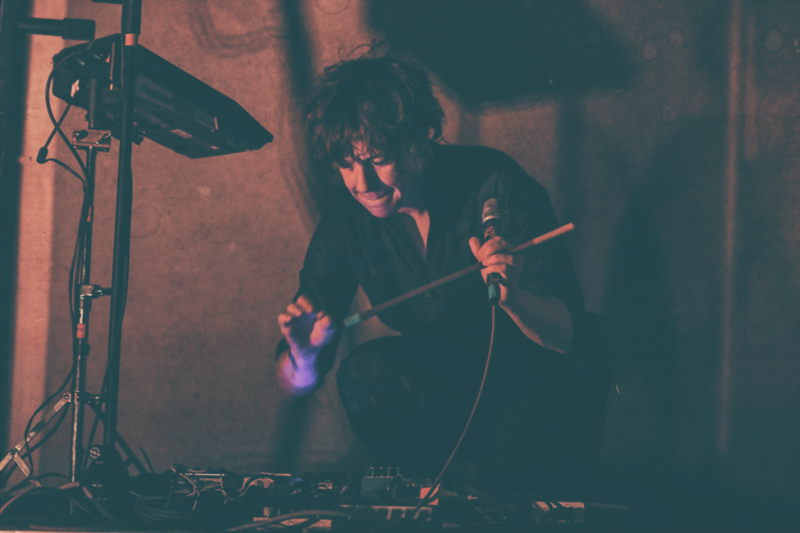 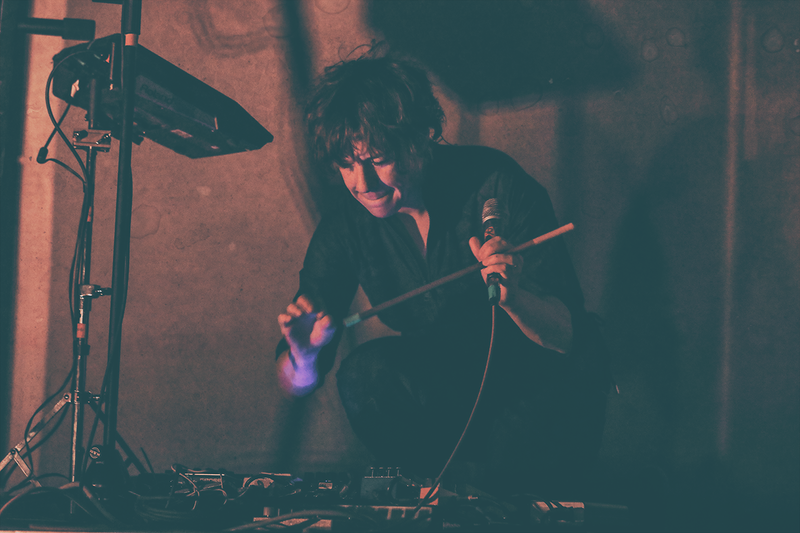 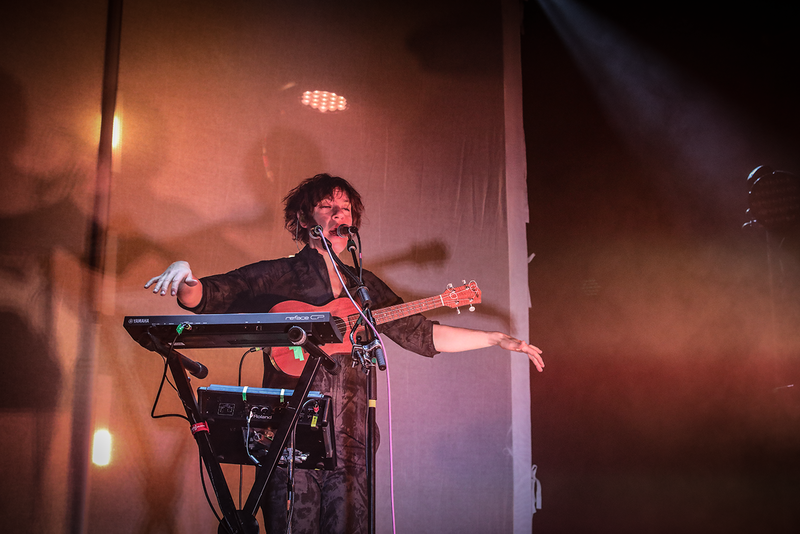 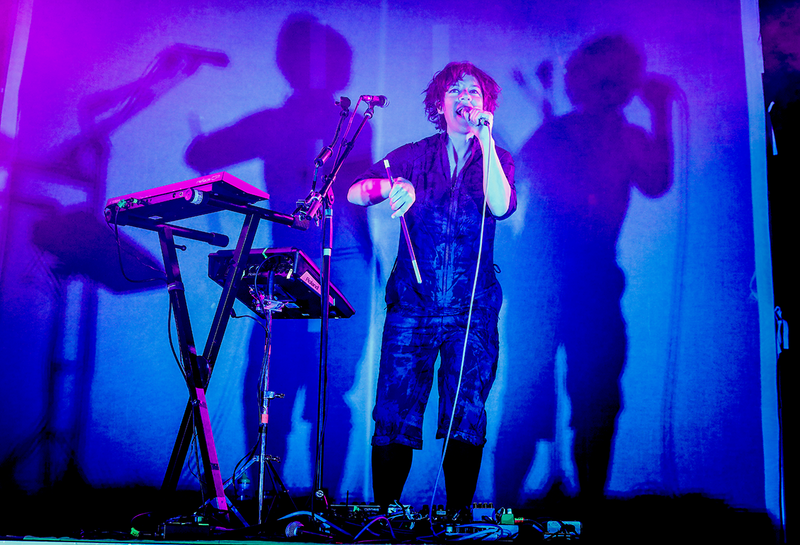 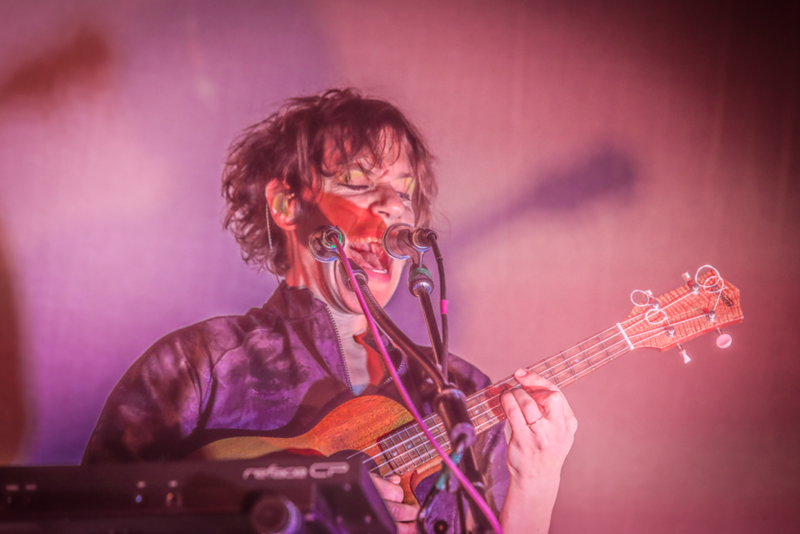 tUnE-yArDs’ roller-coaster ups and downs were enough to fill your stomach with butterflies and make your head spin – and when you’re standing on solid ground, that’s nothing less than magic.